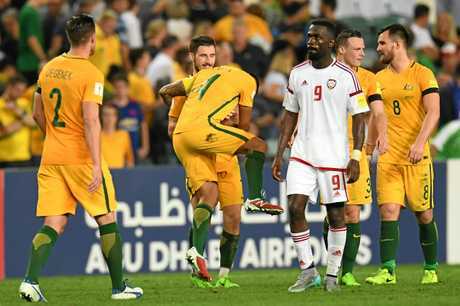 AUSTRALIA'S chances of qualifying directly for next year's World Cup were given a dramatic and unexpected boost overnight after Saudi Arabia crashed to a shock 2-1 loss to the UAE. All of a sudden, a win for Ange Postecoglou's side against Japan at Saitama Stadium on Thursday night would secure its spot in Russia. Despite being away from home, the Saudis had been expected to account for their Middle Eastern rivals in Al Ain. A win would have taken the Green Falcons two points clear of Japan and three points clear of Australia ahead of that pair's meeting just outside of Tokyo. UAE star Omar Abdulrahman pulled out through injury and, with everything that was on the line for the Saudis, the visitors were widely tipped to get the job done. Things were on the right track when Nawaf Al-Abid put Saudi Arabia in front from the penalty spot in the 20th minute. But UAE refused to roll over, throwing the Group B permutations on their head on the back of two utterly brilliant strikes in either half. Ali Mabkhout equalised just two minutes after Al-Abid scored, in almost one motion bringing down a cross into the box with his foot before turning and lashing the ball into the net. And Ahmed Khalil's winner was just as impressive, a withering strike from well outside the box on the hour mark. Saudi Arabia hosts Japan in Jeddah next Wednesday morning (AEST), hours after Australia plays stragglers Thailand at AAMI Park. But given that the dates of the Muslim pilgrimage of Hajj meant the Saudi Arabia-UAE game was played two days earlier than the other Group B encounters, both Japan and Australia now have the advantage of knowing exactly what is on the line at Saitama Stadium. Given their major qualification rivals will take points off each other next week, Ange Postecoglou's men now know a first win on Japanese soil will be enough to secure a spot at a fourth consecutive World Cup as they would sit two points clear of Japan and three points clear of Saudi Arabia heading into the final matchday. That would catapult the Samurai Blue into a nailbiting, winner-takes-all clash with Saudi Arabia next week, although a draw for Japan in that match would be enough to see it scrape through. 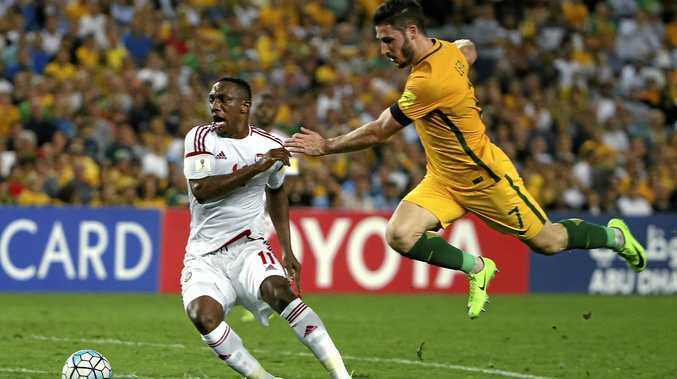 But even a draw against Japan would go a long way to securing qualification for Australia. In that scenario, only a shock result against Thailand in which the Socceroos fail to pick up all three points would put them in any danger of having to qualify through the playoffs. A loss to Thailand on Tuesday would mean the Saudis could draw with Japan and again leapfrog Australia into second. A draw against Thailand would require Saudi Arabia to win its last game. A stalemate for Japan would still leave it in a sticky situation heading into next week, as a loss to Saudi Arabia coupled with an Australia win over Thailand would send it to the playoffs. But don't think we're on easy street just yet, as a loss would still leave Australia's qualification hopes on a knife's edge. A Japan win at Saitama Stadium would see it seal its qualification with a game to play given it would sit four points clear of both Saudi Arabia and Australia. It would also leave Saudi Arabia and Australia deadlocked on 16 points going into the final round. Assuming both teams then win their final games - which the Gulf side would be favoured to do considering the game would mean little to Japan - the two would be engaged in a shootout to see who can come out with the better goal difference, as they would both be tied on 19 points come the end of the section. While Australia appears to have the easier game on paper, the Saudis have two distinct advantages in this scenario. 1) They will go into the final matchday at least one goal ahead on goal difference, depending on how many goals Australia had lost to Japan by - they were both on +6 going into the Japan-Australia game. 2) Given their game kicks off later, they will know exactly how many goals they need to win by having already seen the Australia-Thailand result. In any case, an Australian loss to Japan will mean that there is no way the Socceroos can have that magic "we're going to Russia" moment at AAMI Park, as their qualification hopes will still depend on what transpires in Jeddah. So while the situation is now a little less complicated for Postecoglou's side, there is still enough there to make your head hurt. That's why we won't bother adding the small, small possibility of the UAE sneaking into the playoff spot into the equation.